At Wy’East Mountain Academy (formerly Windells Academy), we are committed to helping your student grow and learn not only in the classroom, but also within their sport. Our program has produced countless noteworthy and successful action sports athletes including Olympic, X Games and Dew Tour medalists. Our incredible coaches are dedicated to helping your student become the best they can be. Our campus also offers world class training facilities which include a dry slope and two olympic trampolines for added land training. The students’ schedules include trampoline clinics that are led by our coaches twice weekly with access to trampolines daily. Our athletes benefit not only from our world-class facilities, but also from our location at the base of Mt. Hood, where we can ski and snowboard on real snow, year-round, thanks to the Palmer Snowfield. Our students are encouraged to take advantage of our Academy Ambassador Program during the summer months which allows them to complete summer school credits and train on the Windells and High Cascade Private Parks on Mt. Hood. Competition season brings many travel opportunities for students. Depending on their level of ability, coaches compile a competition schedule that meets their goals and matches their skill level. In the past students have traveled domestically to events such as USASA Nationals, the Revolution Tour, Volcom’s Peanut Butter and Jelly Rail Jam, TransWorld Snowboarding's Trans Am, Dew Tour, Grand Prix, and X-games. Internationally students have traveled to for training in New Zealand and South America, the European X-games, various world cup events throughout the world. Wy'East Mountain Academy’s snowboard program is led by Head Snowboard Coach, Tommie Bennett. Our program has a balanced approach to having fun while training and competing, and Tommie makes sure that snowboarding improves our students as people, every day. His dedication to our students' well-being, progression, and safety is unsurpassed. Our Balanced Training System incorporates our on-campus facilities with on-snow training here at Mt. Hood and across the country. Through carefully planned opportunities, students develop important life skills that include time management, teamwork, and independence. Wy'East Mountain Academy (formerly Windells Academy) offers the only skateboard program of its kind, in the world. The program is led by Skate Director Jamie Weller, who is regarded as an industry leader with many years of experience, as well as Head Skate Coach Donovan Lawler. Their combined connections in the skateboard industry have enhanced student experiences by providing amazing opportunities that would not be possible outside of Wy'East Mountain Academy. Just last year, our skaters visited 85 different skateparks, ranging from Oregon, California, the Academy is located just outside of Portland, Oregon which is home to over 200 innovative, world-famous skateparks. Wy’East also has exclusive access to indoor skateparks such as Nike’s facility as well as Silas Baxter’s personal, private indoor skatepark, built by our very own Jamie Weller. Influenced by weather, students depart campus daily to skate the hundreds of options they have within the region. The Academy’s ski program is lead by Head Ski Coach Brian McCarthy. Under his direction our students’ opportunities are limitless in training, traveling, and competing. Through various opportunities, students develop important life skills that include time management, teamwork, and independence. Wy'East Mountain Academy is the world’s exclusive academy than can offer students on-snow training every month of the year. With the academy based in the foothills of Mt. Hood, the utilization of the mountain’s year-round glaciers are maximized. Wy'East Mountain Academy has partnered with Timberline ski area to offer students the only private park™ in North America during the months of August, September, October, and November. This provides students an advantage for each upcoming winter competition season by training months in advance when compared to other training athletes. 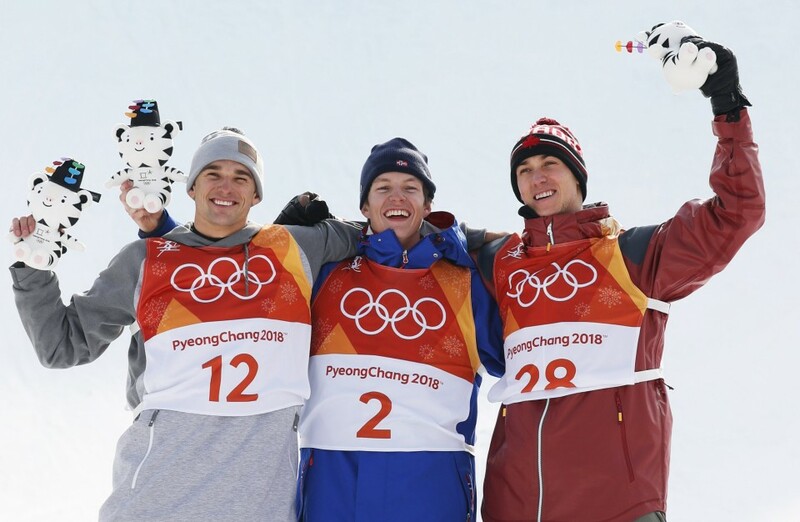 Academy Alumni Nick Goepper (left, silver medal) and Alex Beaulieu-Marchand (right, bronze) stand on the Olympic podium for Men's Slopestyle Skiing. While at Wy'East Mountain Academy (Windells Academy during their enrollment) Nick Goepper and Alex Beaulieu-Marchand (ABM) were roommates and friends. They are now competing against each other on the world stage; Nick representing the USA and ABM representing Canada. Both competed in the 2014 Sochi Olympics, and most recently took home medals in the 2018 Winter Olympics in PyeongChang, South Korea. Not long ago they were Wy'East Mountain Academy students skiing and going to class every day. It just goes to show that with a little hard work, dedication and determination, dreams can come true. Follow our blog for up to date news and info about our current students and academy alumni.